At a time when the modal share of private cars was increasing across the developed world, Freiburg in southwest Germany has attracted growing interest as a city which successfully ‘bucked the trend’. After nearly three decades of policies designed to constrain car use, in 1998 the largest ‘carfree’ development in Europe began construction there. 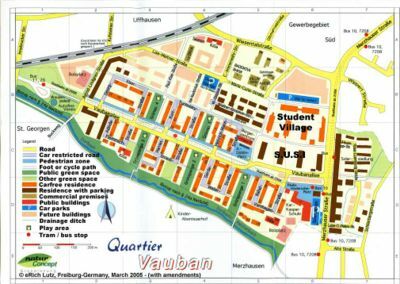 This new district, Vauban, was the principal reason for my study visit during the summer of 2006. I cycled there from the UK, enabling me to compare the experience with cities in France, and Basel in Switzerland. I stayed for two weeks in Vauban, explored the rest of Freiburg and surrounding areas by bicycle and tram, interviewed officials from the city council, Forum Vauban (residents’ group), the German cycling federation and the citywide car club. I also obtained useful information and impressions from local residents, although I did not attempt any survey or formal interviews with them. Several of interviewees referred to a campaign during the 1970s against plans for a nuclear power plant as a turning point in Freiburg’s history. Some remembered it before then as a conservative place with a growing traffic problem. Today it is the only major city with a Green mayor; quality of life is a municipal objective. Several confirmed Scheurer’s (2001) description of Freiburg as a destination for “lifestyle migration”. It was also described as Germany’s fastest growing city (its 2004 population, 213,000 was 19% higher than 1987). Freiburg’s historic centre of was progressively pedestrianised from 1971 onwards (Monheim, 1997). The first cycle path network was also planned in 1971 and the following year, defying a national trend, a decision was taken to retain and extend the tram network. In 1984 a low-cost all mode regional public transport pass was introduced, which Fitzroy and Smith (1998) identify as the most important factor behind the doubling of public transport journeys over the following decade. The tram system provides the backbone to the public transport network (see figure 1). 70% of local public transport trips are made by tram; 30% by bus. Buses, along with regional rail serve suburbs and surrounding towns and villages as well as the inner city, but do not compete with trams along the central east-west spine of the city centre. The trams run mainly along streets, often the central lanes of boulevards, with greater priority than the buses, but the system suffers from a bottleneck along that central spine, where concentrations of pedestrians delay their progress. As a result, cycling is often quicker. The proposed extensions will alleviate this bottleneck, though these are dependent upon Federal or regional capital funding, currently under review. City centre parking capacity does not appear to exert any significant constraint. 14 car parks in and around the centre have more than compensated for the suppression of on-street parking. Hourly rates of 50c (35p, suburbs) to 2€ (£1.40, centre) are modest by UK standards, although many Freiburgers believe them to be expensive. Figure 2 illustrates the city council’s assessment of change in modal share. Car journeys have declined, cycling and public transport trips have increased relatively and absolutely. They believe the fall in walking as a main mode reflects the near-universal take-up of public transport passes costing just 41€ (£29) per month and transferable within households. The mixture of cycle lanes, shared paths, junction priority and traffic calmed roads can be found in many UK or French cities but the key differences are the comprehensiveness, continuity and consistent priority of cycle routes. Cycle parking is a problem in the centre, despite the 1000 place cycle park by the main railway station. By UK standards, drivers are courteous, respecting the priority measures, but some of the cyclists seem comparatively aggressive. There are occasional conflicts with pedestrians on shared paths – facilities which the cycling federation has campaigned against. The potential for cycling to public health has been recognised by the largest national health insurance fund, which is offering prizes to members committing to regular cycle commuting. No one I spoke to was aware of any research into the health impacts of Freiburg’s transport policies, however. The benefits of more cycling may be partly offset by a fall in walking distances if we assume, following figure 2 that walks before and after public transport tend to be shorter. 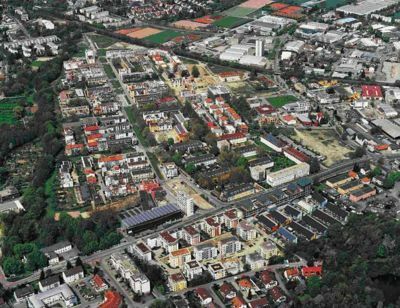 In 1992 the French army vacated Vauban barracks, a 41 hectare site on the southern edge of Freiburg, 3km from the city centre. Two parcels were sold separately at the beginning; the old barracks on these have been converted for student accommodation and the S.U.S.I. alternative community (see attachment). For the remaining 38 hectares the council delegated the mandatory community consultation to Forum Vauban, who had convinced an initially sceptical council to try the ‘carfree’ concept. Relations between the two have fluctuated as they worked together on the development. The masterplan foresaw the construction of 2000 dwellings over 8 years from 1998 when building began, leading to a final population of around 5000. Completions have been slightly slower than originally planned, but due to larger than expected household size, population reached 4,500 during 2006 and was expected to exceed 5,500 by completion in 2008. 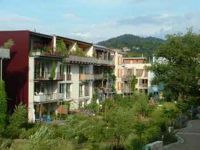 Most of the individual plots have been sold to Baugruppen (co-housing groups) whose bids are assessed against criteria favouring families with children, older people and Freiburg residents. Some Baugruppen were formed by architects, others by prospective residents planning varying elements of self-build. With net densities of 90 to 100 per hectare and a floor area ratio of 1.2, there are few individual houses. Most blocks are four stories high. Within these constraints the policy has facilitated considerable architectural diversity. The masterplan required all buildings on the site to be low energy. A combined heat and power plant burning wood chips and gas provides electricity for around two thirds of Vauban. About one in seven of the dwellings are passive houses using passive solar heating with heat exchangers. Many residential and commercial blocks have solar or PV panels. A sustainable urban drainage system covers the district and there have been innovations in waste water treatment. Only a small area was zoned for employment use, although shops and small businesses are located throughout Vauban. A larger employment area immediately adjoins the district. 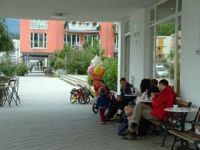 Smaller shops and cafes are distributed along Vaubanallee, benefiting from the shelter of overhanging buildings. 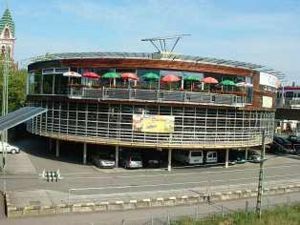 There are two medium-sized supermarkets, one entirely organic, on the junction with Merzhauser Strasse, where most shoppers appeared to arrive by bicycle or on foot (Nobis, 2003, found that Vauban’s car owners tended to do their bulk shopping at another hypermarket). Predictably, some car owners have tried to circumvent these rules, registering cars in relatives’ names, making private arrangements with residents outside the carfree area, or parking on land as yet undeveloped. The Carfree Association works to resolve these conflicts but the Council has resorted to legal action on two occasions. Vehicles are allowed down one side of Vaubanallee at 30 kmph (18 mph), where on-street parking is metered. Vehicles may enter the roads in the carfree areas at walking pace for pick-up and deliveries only. 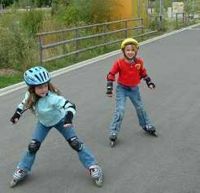 There are some infractions – controls are rare and penalties light, a source of annoyance to some residents without cars. The city-wide car club has the greatest concentration of its 2,500 members in Vauban – at least ten of its cars are stationed around the district. A tramline was extended to Vauban as planned, early in 2006. Longstanding plans for a regional rail station are progressing slowly. Scheurer’s survey in 2000 found car ownership surprisingly high at 54%, although car use (16% of trips) was very low. Significantly Nobis found that 57% of those living without cars had given them up on moving to Vauban. 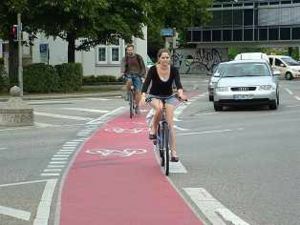 Both Scheurer and Nobis (2003) found that cycling was the predominant mode – Scheurer found three quarters of the working population cycled to work. Public transport (i.e. bus) use was low in both surveys. The trams are now frequent and well used but my observations suggest cycling remains very important, with cycle trailers commonly used to carry children and shopping. Bicycles entering and leaving the district considerably outnumbered motor vehicles. Despite occasional problems the traffic management system does appear to have achieved its principal objective, to provide residential areas almost entirely free of vehicles. 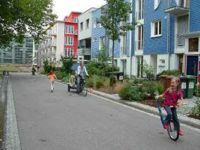 The carfree streets were full of young children, often unsupervised, playing or cycling – noticeably more so than in the Spielstrasse (homezones) with parking which are common elsewhere in Freiburg, and in Basel. The 76% of households with children and average household size of 3.34 found by Scheurer have evidently fallen as Vauban has grown, but young children still seem to form a large proportion of the population. Neither Scheurer’s nor Nobis’s survey asked about income or occupation although my (limited) observations tend to confirm Scheurer’s impression of an ecologically aware population (mainly Green voters) largely working in service sector professions. 200 units, around 10% of the ultimate target, are social housing. The rest are overwhelmingly owner occupied. Few of the original occupiers have moved; dwellings resold so far have (I was told) been relatively expensive by national and city (though not UK) standards. Forum Vauban’s online message board contains more seekers (mainly to rent) than offers. 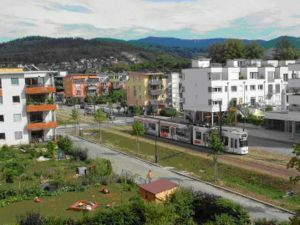 The Freiburg experience has often featured in UK planning and transport discourse. The consultants working on the Harlow North extension (before its recent rejection by the RSS inspector), for example, were given a brief to achieve Freiburg levels of modal share. Carfree residential areas were one proposed element. The phrase “car-free” is generally used by UK planners and developers to mean housing with no parking, regardless of its exposure to traffic. As yet, nothing like Vauban exists in this country. Ironically some of the difficulties encountered there could be avoided here. PPG3 (2000) abolished minimum parking ratios and specifically allowed for carfree housing. The parking controls evidently lacking in Vauban, are ubiquitous in most British cities, with penalties more severe. A culture of cycling for transport exists in a few, mainly older university towns and cities, although in my experience none has created such favourable circumstances for cycling. Other factors such as deregulated public transport (outside London) with increasing emphasis on buses over other modes may present greater challenges. Research at Loughborough University (Morris, 2005) is examining the reasons why carfree development has not been more widely implemented in the UK – initial findings suggest planners and developers each tend to blame the other. Developers with whom I have discussed the concept are sceptical that demand amongst buyers of new homes would ever enable the implementation of a district such as Vauban. Potential demand for carfree living, and its implication for UK planning and transport policy, are the main focus of my ongoing research funded by the ESRC and Department for Transport. Thanks to Stadt Freiburg for figure 1 and the photographs of the Schwabentor, and to eRich Lutz for the attached map of Freiburg (which has been amended). FITZROY, F. and SMITH, I., 1998. Public transport demand in Freiburg: why did patronage double in a decade? Transport Policy, 5(3), pp. 163-173. MONHEIM, R., 1997. 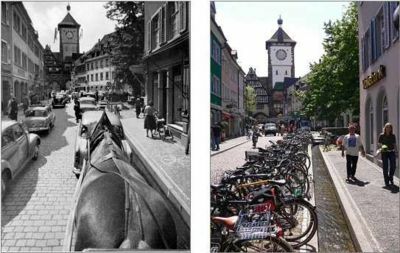 The Evolution from Pedestrian Areas to 'Car-free' City Centres in Germany. In: R. TOLLEY, ed, The greening of urban transport : planning * for walking and cycling in Western cities. 2nd edn. Chichester: Wiley, pp. 253-265. MORRIS, D., 2005. Car-Free Development: The Potential For Community Travel Plans. Universities Transport Study Group. NOBIS, C., 2003. The impact of car-free housing districts on mobility behaviour – Case study, E. BERIATOS, C.A. BREBBIA, H. COCCOSSIS and A. KUNGOLOS, eds. In: International Conference on Sustainable Planning and Development, 2003 2003, WIT pp701-720. SCHEURER, J., 2001. Urban Ecology, Innovations in Housing Policy and the Future of Cities: Towards Sustainability in Neighbourhood Communities. PhD edn. Perth: Murdoch University Institute of Sustainable Transport. (c) Steve Melia 2006. You may print and quote from this report for personal use (providing no money is charged for it). Please do not reproduce any of the maps or photographs without permission. This page was last modified 05:50, 12 June 2008. This page has been accessed 70,919 times.